he Kerch Strait is a little-known part of the world, yet it is extremely important. It is the lifeline connecting Ukraine into the Azov Sea, as well as the port of Mariupol. From this small waterway, Ukraine has maritime access to the wider world. Unfortunately for Ukraine, the Kerch Strait—like the strategic port of Mariupol—has been controlled by Russia since their illegal annexation of Crimea in 2014. And, while a bilateral treaty exists between Ukraine and the Russian Federation granting equal and unrestricted access to the Kerch Strait, harassment has been endured by vessels from both countries at the hands of both Russian or Ukrainian forces there. Recently, a provocative video was broadcast around the world showing a Russian ship ramming a Ukrainian naval boat. 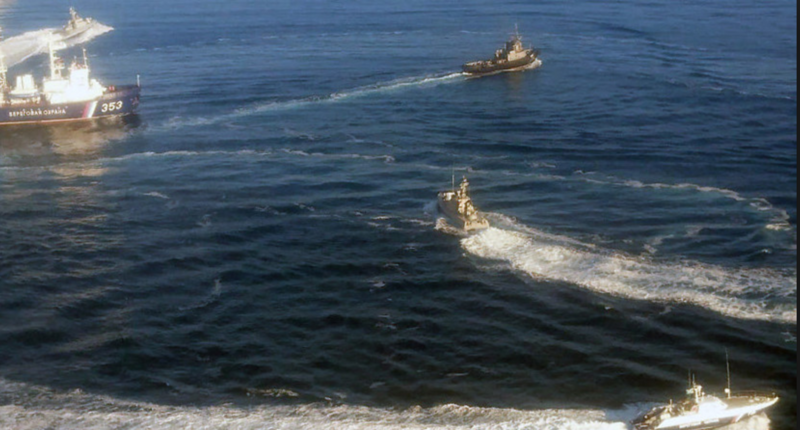 The ramming occurred after Ukraine ordered their ships through the Kerch Strait into the Sea of Azov, thereby violating a Russian order suspending all passage through the Kerch Strait. Courtesy of France 24 English. In other words, the Ukrainians were performing the same kind of freedom of navigation operation that U.S. Navy warships conduct routinely in the South China Sea, where China has placed similar illegal restrictions on the use of international waters. Meanwhile, according to the BBC, two Ukrainian naval gunboats and a tug were captured by Russian forces—with several Ukrainian personnel being injured. In response, the Ukrainian war cabinet was convened by Ukraine’s leader, Petro Poroshenko, and lasted until 2 a.m. Monday morning. It is believed that Poroshenko will ask Ukraine’s parliament to implement martial law. In so doing, martial law would likely suspend the pending presidential elections in Ukraine that are set to be held in four months’ time. Not only would elections be suspended indefinitely, but so too would a ban on public demonstrations, as well as compulsory military service—as well as government takeover of the national television networks—be enacted. The European Union is beating its turgid drum against Russia. It has vowed “targeted measures” to ensure that the Kerch Strait was fully opened to international—particularly Ukrainian—traffic. NATO continues trumpeting its tired line that it “fully supports Ukraine’s sovereignty and its territorial integrity” (except when it didn’t support Ukraine’s sovereignty in 2014, when Russian troops invaded and annexed Crimea). The American response has been muted. This is not because President Donald Trump is a Russian spy, as the Left would have you believe. It is more likely because a) it’s a holiday and b) the White House is still gathering the facts. Naturally, the Russians deny any part in the provocation of hostilities. They blame everything on the Ukrainians. President Vladimir Putin—the would-be tsar—has called for a meeting of the United Nations Security Council on Tuesday of this week. Fireworks are sure to ensue. What’s important to remember here is that the Russian Federation had no right to violate the 2003 treaty between Ukraine and Russian granting free navigation to ships from both countries in the Kerch Strait. What’s more, the Russians most assuredly did violate Ukrainian sovereignty in 2014, when they annexed Crimea (and continue lending lethal aid to separatists in eastern Ukraine). Unfortunately, though, there is no way the West can alter the fact that Russia now controls Crimea short of going to war (which, most definitely would devolve into a nuclear world war). And, one mustn’t forget that Ukrainian politics is notoriously corrupt. With a presidential election just four short months away—and with the current president, Petro Poroshenko, struggling in the polls—it would not be outside the realm of possibility that either he or his supporters in the Ukrainian military are stoking this crisis to keep Poroshenko in power a while longer. Washington cannot lose its head on this matter. This isn’t Hitler marching into Poland in 1939. This is more akin to the Agadir Crisis in 1911. The Agadir Crisis was an outgrowth of German and French competition for greater influence in Morocco. The crisis was ultimately settled by slow negotiations which ratcheted down tensions. Of course, this event was one of those moments in history which set the proverbial stage for a far nastier event—the First World War—but the Agadir Crisis itself was small and ameliorated with shrewd diplomacy between the affected powers. The White House should not even entertain a military intervention on behalf of Ukraine. Instead, Washington should reiterate its commitment to the freedom of navigation while at the same time pressing ahead with creating a lasting stability between Russia and the West in Ukraine. As the crisis mounts, the hawks must be ignored. We’ve never been closer to great power conflict than right now. Yet, it can still be avoided (and it must be). Brandon J. Weichert can be reached on Twitter @WeTheBrandon. Also head over to The American Spectator website for more thrilling content! Next Can America’s Anti-Empire Survive?